Greece is probably the first foreign location I had ever wanted to visit & I can recall wanting to visit there ever since I was a young child reading about all of the mythical stories. 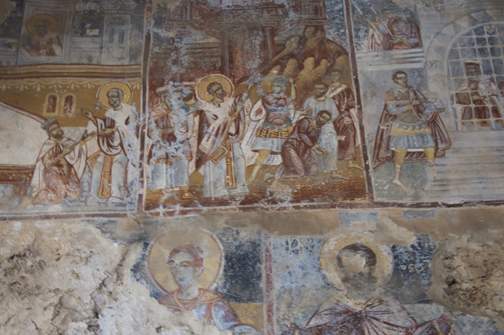 In college I minored in art history, focusing on the old stuff (ancient, classical, Byzantine, Renaissance) which only furthered my interest in visiting Greece. Anyway, I finally made it there! For as much as I knew what to expect as far as the ruins & architecture & the history go I was still surprised to find the place even more amazing than I was thinking it would be. 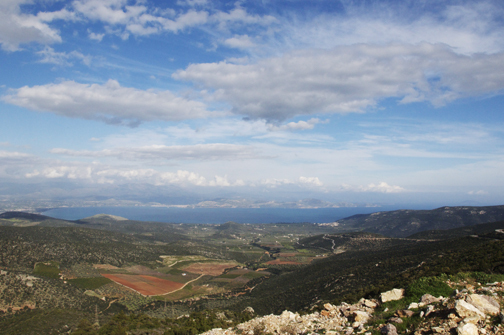 Greece is stunningly beautiful, particularly the landscape. The clear Mediterranean, mountains everywhere & a huge variety of plant life from palm trees to cypresses & wildflowers in all colors. To top it off the food was some of the best I have ever had as well. I’ve always been a big fan of Mediterranean cuisine, but having the really real deal is a whole different ballgame from Mediterranean in another country (gyros, I never knew you like that). Their vegetables, cheeses & wines were really tops. The first stop was, of course, Athens. 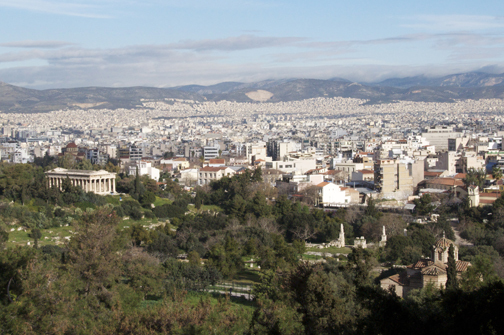 The city itself was absolutely sprawling, larger than I was expecting & something of an impressive sight when seen from a hilltop or the Acropolis. 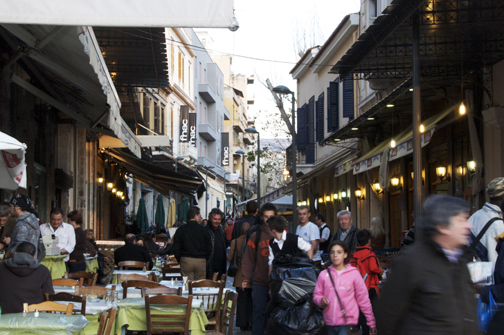 We stayed in the small Tempi Hotel in the Monastiraki district, which was just a stone’s throw from the Acropolis & Agora not to mention an endless variety of cafes, shopping & general sight-seeing. Good thing the location was excellent with friendly & helpful staff because other than being clean the hotel itself was nothing to write home about. 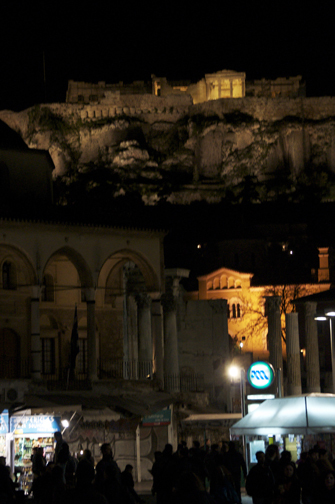 After arriving at night only to find Athens’ weather gloomy & rainy, it was a relief to see the next morning dry & clear. Devouring some apple pie for breakfast (eating responsibly on holiday, forget about it) we strolled directly off to see the Acropolis. Even though March is far from tourist season in Greece, we were still very lucky to get to the Acropolis right after it opened. There were few people there other than us at the start, but by the time we were on our way out, about an hour later, the place had begun to swarm with tour groups & students. I can’t even imagine how packed the historic sites must be in the summer. Very unpleasant I would think. 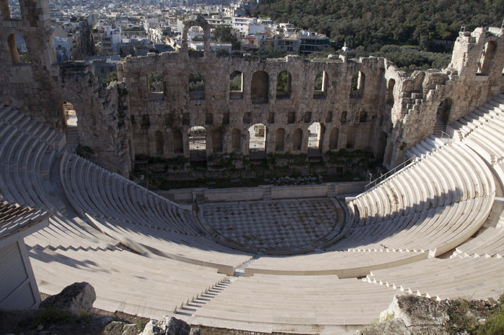 Some of the sites at the Acropolis include the Theatre of Dionysus, the Propyleae, the Parthenon & the Erechtheion. 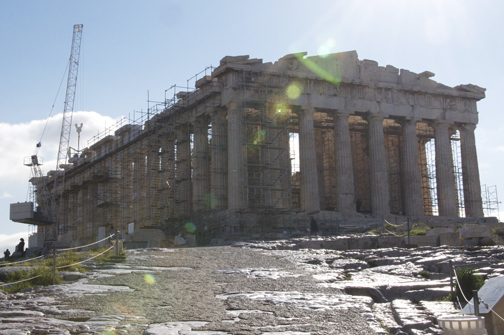 It was a shame to see that there was much construction/refurbishing going on at the Parthenon and the Propyleae but even surrounded with all of that the structures were still pretty magnificent sights. 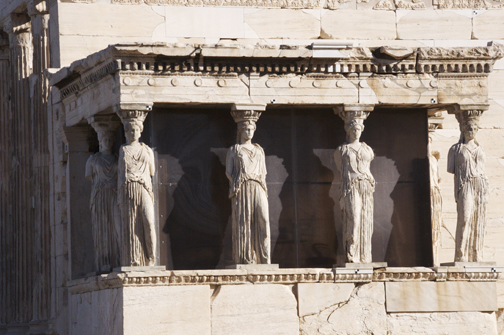 The Erechtheion was my favorite bit of the Acropolis due to its more complex design & its Porch of the Caryatids. 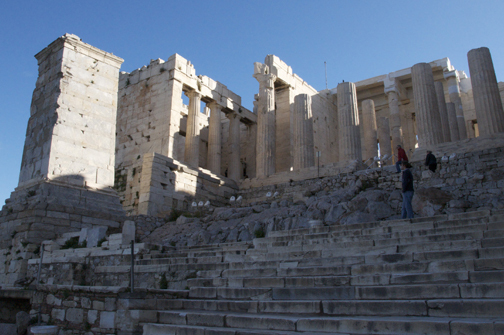 At the base of the Acropolis we found ourselves in the Agora. 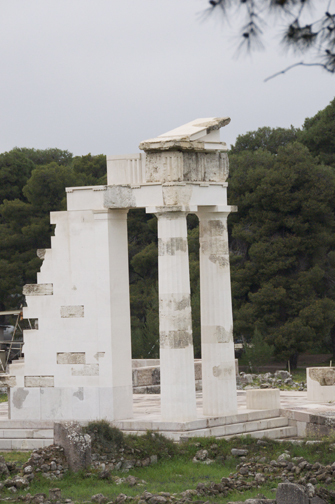 The reconstructed Stoa of Attalos is here, which houses the Museum of the Ancient Agora. 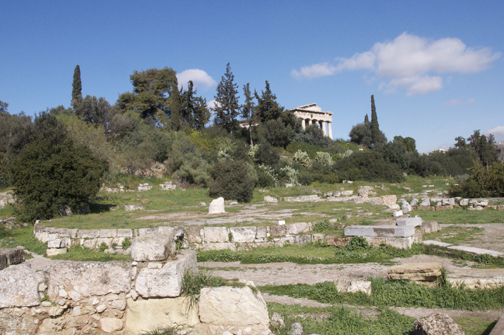 I rather preferred the Agora to the Acropolis as I found the grassy forum dotted with ruins & wildflowers, crowned with the Temple of Hephaestus upon the hill, which remains to be in pretty good condition, quite picturesque. Our next stop was the waterfront town of Nafplio in the Peloponnese, which was actually the first capital of modern Greece. 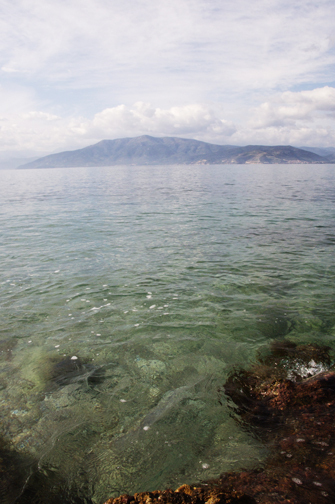 I really cannot express how much I loved Nafplio. 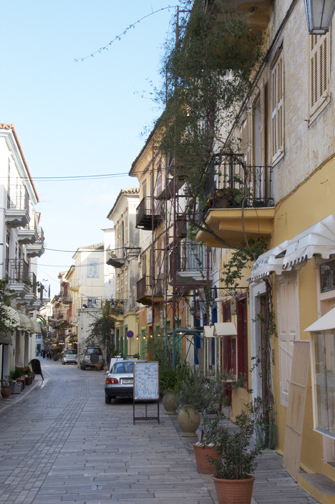 I am a pretty firm believer of not revisiting a location as there is so much else to see in the world, but Nafplio is now added to my short list of exceptions (along with Ubud, Bali). 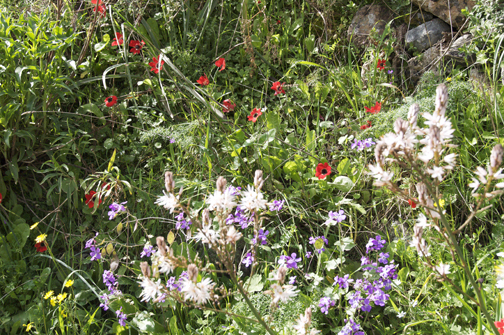 We stayed at the Pension Dafni, near the base of the Acronauplia. It was a sharp contrast to Athens as the lodgings were very quiet & comfortable; we had a suite with a nice bedroom, sitting room and two balconies! The cobbled streets & squares are lined with colorful buildings housing boutiques, restaurants & pensions. Above the town you see the Acronauplia & Palamidi castle/fortress & in the harbor is the Bourtzi fort, the latter two being Venetian (Nafplio was once part of the Venetian Republic). 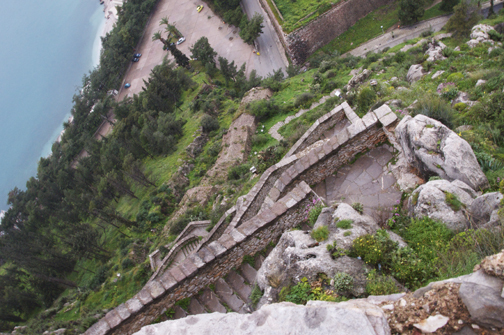 You can walk up the steps to the Palamidi fortress (which we did) & get a lovely view of Nafplio & the surrounding Grecian landscape in the process. Unofficially there are 999 steps to the top, but whatever the real number is, it still makes for a rather good work out. 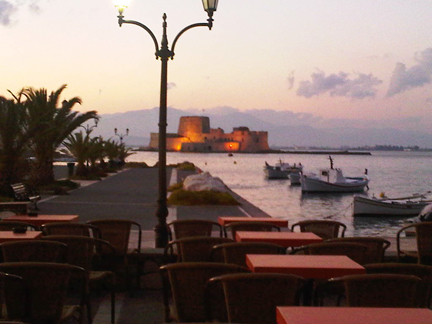 In addition to Nafplio’s own charms the location is also great as you can easily take short trips away to other interesting sites. 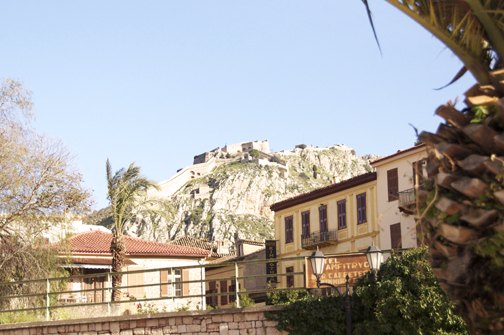 We decided to rent a car & within two days had easily visited the sites of Epidavros, Mycenae & Mystras without feeling at all cramped for time while still being able to do plenty of relaxing & sightseeing in Nafplio. After spending a good amount of time doing a bit of exploring, shopping & dining we started to head out to see other Peloponnese sights. 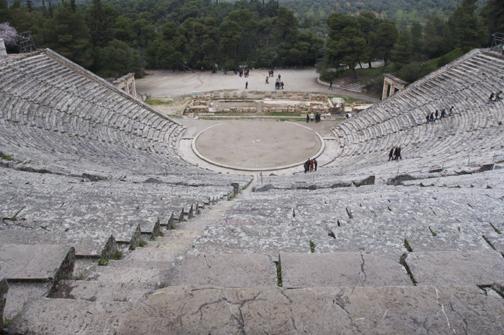 Out first stop was Epidavros which included the Asclepieion & the Theatre of Epidavros. And cats, lots of cats. To be fair, all of Greece was filled with stray cats & dogs, the vast majority of which seemed to be very well-fed & nicely treated! 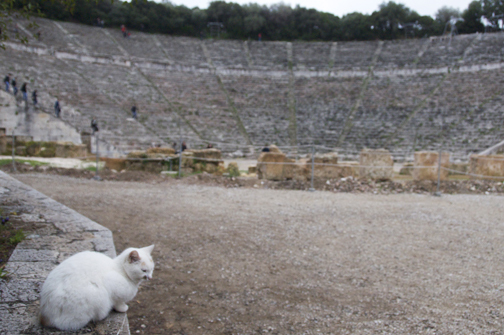 Epidavros however, had a particularly choice selection of stray cats. The theatre was quite a sight though. In the summers, during the Hellenic Festival shows are still put on there, which I think would be a really great event & another excellent reason to return to the area. 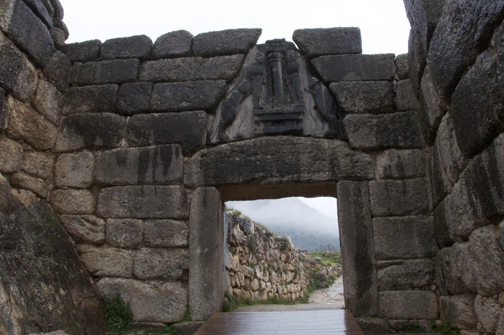 Mycenae‘s citadel & Treasury of Atreus was next on the list & unfortunately it was at this point where we had our one slightly annoying bout of light rain. 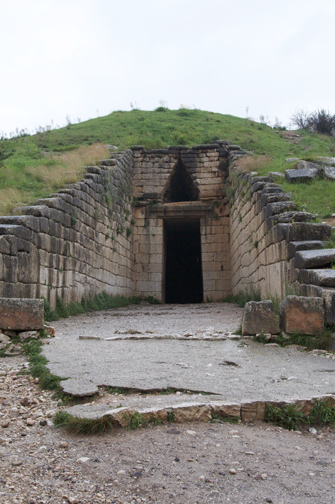 Mycenae’s history & legend is vast which gives you a lot to think about while walking around the ruins of the citadel. The following day we decided to drive out to Sparta. Which as a modern town was not noteworthy. There was a statue of King Leonidas. The end. been some of my very favorite. 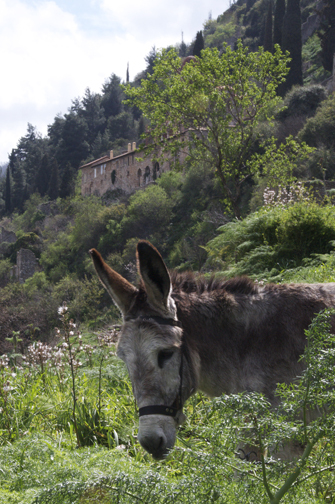 It is quite a trek from the bottom of the fortified town up to the remains of the castle at the very top, but the idyllic scenery makes it well-worth the energy. The site was pretty empty which was nice for a change. The bottom bits near the entrance had a few small groups, but the higher you went people quickly disappeared. 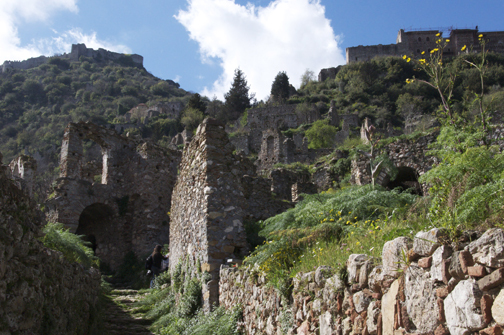 While exploring & relaxing in the castle ruins, we were the only people around. 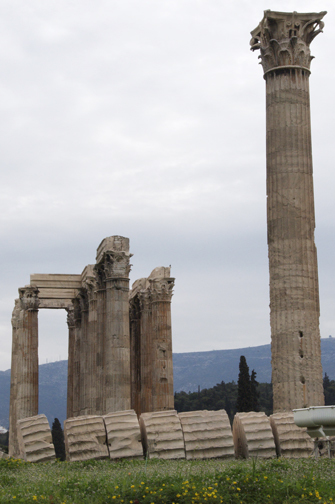 After leaving Nafplio & the Peloponnese we spent a final night & day in Athens taking in bits of the city we missed originally, like the Temple of Olympian Zeus & the new Acropolis Museum and the National Archaeology Museum of Athens. 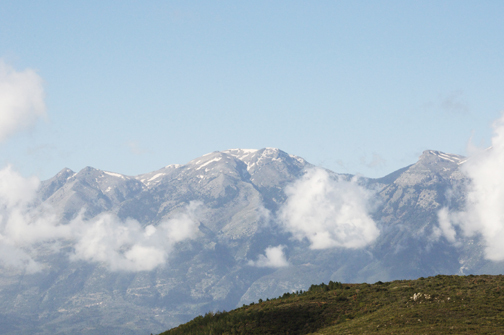 I was definitely sad to leave Greece but I look forward to returning again to revisit Nafplio (the Amphitryon Hotel has got my name written all over it) & check out some places we missed like Mount Olympus & most certainly do some Grecian island-hopping!